Ancestry.com has a very detailed blog titled “More Than a Pie Chart and a Number: Reading Your Ethnicity Estimate”. It provides information that can help you understand more about your ethnicity results from AncestryDNA. Why is it called an ethnicity estimate? Ancestry.com says that creating an ethnicity estimate based on your DNA sample is a complex process which is based on probability, statistics, shared DNA and ongoing research and science. AncestryDNA calculates your ethnicity estimate by comparing it to a reference panel. Over time, it is possible for more data to be discovered. Reference panels can change, and so can the way AncestryDNA analyzes your DNA. This means it is possible for your ethnicity results to change when they get more data. A reference panel is the group of people that AncestryDNA compares your DNA to. A reference panel is made up of thousands of people. To create a reference panel, AncestryDNA scientists test lots of people whose families have lived in one area for generations. Next, the scientists look for trends in the reference panel’s DNA and compare those trends to other groups. After scientists identify trends for each region in the reference panel, they can look for those trends in your AncestryDNA test results. Your ethnicity estimate will include region names and percentages. At the top is an overall percentage from a large region (for example, Europe). Each region in your ethnicity estimate includes two things: a percentage and a range. 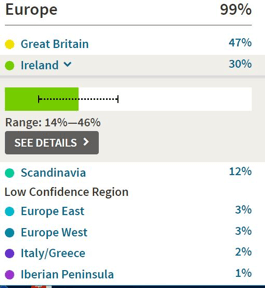 For example, if your ethnicity estimate said you were 30% Irish, you should take a minute to click on that and see the range of percentages associated with that 30% estimate. AncestryDNA determines the range by analyzing each DNA sample an extra 40 times. Doing so gives AncestryDNA 40 different estimates of a person’s ethnicity for each region. They take a look at each of the 40 estimates and find the average amount predicted for each region. That average becomes the percent that is displayed in the estimates. Ancestry says their confidence that your actual genetic ethnicity is EXACTLY the average is not high. After that, they identify the probably range from the 40 different estimates. The range shown in the product experience encompasses most of the variability found in the estimate. Ancestry says their confidence that your actual genetic ethnicity falls within this range is relatively high.